Suffolk County Legislator Rob Trotta and Rose Mangogna of Kings Park. Smithtown, NY - April 10, 2017 - At the March General Meeting of the Suffolk County Legislature, women from each legislative district were recognized by their respective legislator for their contributions to their community and presented with a proclamation. Rose Mangogna, a longtime volunteer and resident of Kings Park, was selected by Legislator Rob Trotta as the 2017 Woman of Distinction for the 13th Legislative District. “Rose is the consummate volunteer and is passionate about her town and its residents,” said Legislator Trotta. Rose established three new athletic teams for St. Joseph’s CYO in Kings Park, where she continues to coach its Volleyball team. In 2009, she initiated the Track & Field team and is a former coach. She also implemented the TOP Soccer program for children with disabilities. In addition, she is on the committee for St. Joseph’s Family Day Picnic. For more than 10 years, Rose has been involved with the Kings Park Soccer Club, where she is a coach and has been its president for the past seven years. The Long Island Junior Soccer League named Rose its Volunteer of the Year for 2015 in recognition of her outstanding service to the youth of Kings Park and for making a positive difference in their lives. Rose is very active with Cub Scout Pack 75 and Boy Scout Troop 75. She is a committee member for Troop 75 and is the troop’s official photographer. Since 2012, Rose has served on the board of the Nissequogue River State Park and is tireless in her efforts to help enhance, preserve and beautify the park. She helps to organize the park’s Sunset Run and its annual Turkey Trot/Walk for the Park. Rose also co-chairs the annual Kings Park Veterans Day Parade and is responsible for inviting the parade participants and dignitaries, ordering the wreaths, selecting the keynote speaker and publicizing the event. 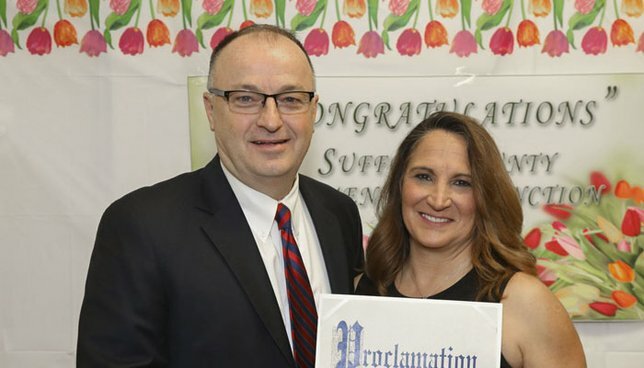 Subject: LongIsland.com - Your Name sent you Article details of "Legislator Rob Trotta Honors Rose Mangogna of Kings Park as the Woman of Distinction"